The Ally Cadence Trust has received a final charity cheque from Boston food producer Freshtime UK, bringing the total after a year of fund raising to £15,064. The trust, set up by Emma and Karl Humphries from Walcott in 2009, provides emotional and financial support for families affected by Spinal Muscular Atrophy (SMA) Type 1. They started the charity in memory of their daughter Ally who lost her own battle with SMA aged just six months. Staff at Freshtime, a leading snack salad and prepared vegetable specialist, raised funds throughout 2014 for the Ally Cadence Trust by staging events such as a climb up Mount Snowdon, a dress-down day, a golf day and a Christmas jumper day. Freshtime Managing Director Mark Newton said the company was very pleased to have been involved with the charity. “The fund raising team has been really committed and the money raised has all been down to the staff’s efforts,” he said. Last year the Trust was able to support 20 families across the UK who have been affected by SMA. Emma is also delighted that thanks to Freshtime’s support the charity has been able to purchase fibre-optic lights for the first time. “We’re in a much better financial position than we were thanks to Freshtime’s donations and we’re so happy to have been able to buy fibre-optic lights for the children – they love them!” said Emma. 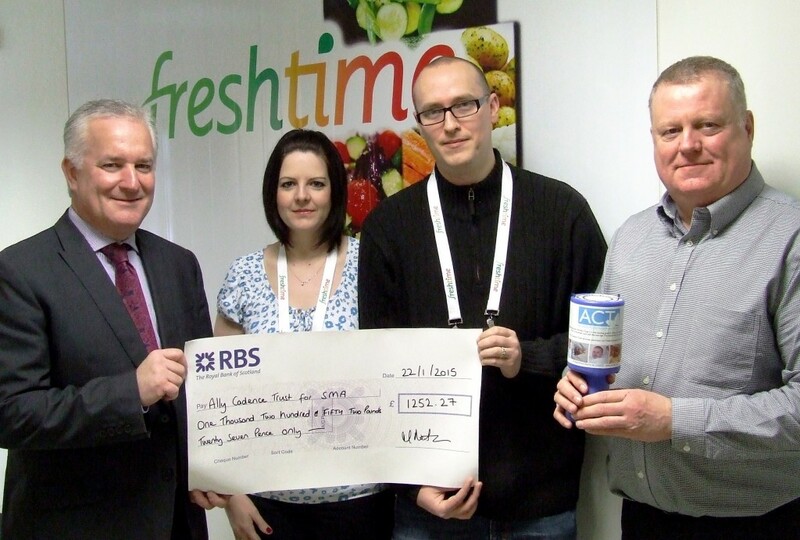 Freshtime’s final donation to the Ally Cadence Trust was a cheque for £1,252.27.